When we first set up the Warré hive, the two central top bars were thicker than spec but the colony was not in a condition for us to change them out. It was a small colony with extremely limited resources. The feeder fit on top so the wonky top bars were of little concern and besides, if all went well and the colony grew, eventually that top box would be harvested and the problem would be taken care of. Well, of course, all did not go well, and the colony simply refused to grow into the bottom box. This happens with bees more often than one would think. For some reason despite being crowded, instead of building into another box some colonies simply swarm. The Warré hive did just that four times, making it glaringly obvious that beekeeper intervention was needed if the colony is to survive. Since they wouldn't move down, giving them a box to move up into made sense. But the two thick top bars complicated what should've been a simple reversing of hive bodies, so the colony ended up getting "major surgery." The hang up for us is that there are some wonky top bars in the hive. 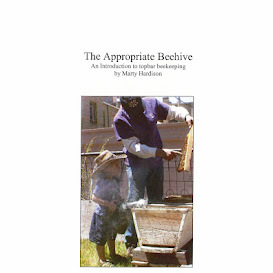 A hive body set on top of the two central top bars wobbles, and there's at least a bee-sized gap. BB and I fashioned an Imirie shim, which would allow us to put the bottom hive body on top, but I neglected to give it to John, our hivesitter. Rather than reversing and pyramiding up, though, John chose to do the manipulation illustrated below (or something very close), to draw the colony down. (Managing downward is the by-the-book Warré way.) The three combs at the far right of the photo above were moved into the bottom box, in a "checkerboard" fashion.† It was easy to move those combs, since they were built in demi-frames (top and side bars only). Bees love to fill spaces, and the goal is to get the bees to both build-up strength with brood combs in the new space in the top box, and to move down the "ladders" and draw fresh combs in the bottom box. If it weren't so hot, we might be concerned about opening up the brood nest, because to succeed the bees absolutely must have enough nurse bees to cover all the brood. Numbers are definitely down after all the swarming, but with our streak of high 90's continuing (and Russian Olives and soon Lindens in bloom), this colony should be okay. Given busy work, hopefully the colony will shift its focus from swarming, grow into the bottom box, and build up enough this season, so that next season we can pull the top box off and finally get those wonky top bars out of there. And we did just that 3 months later.